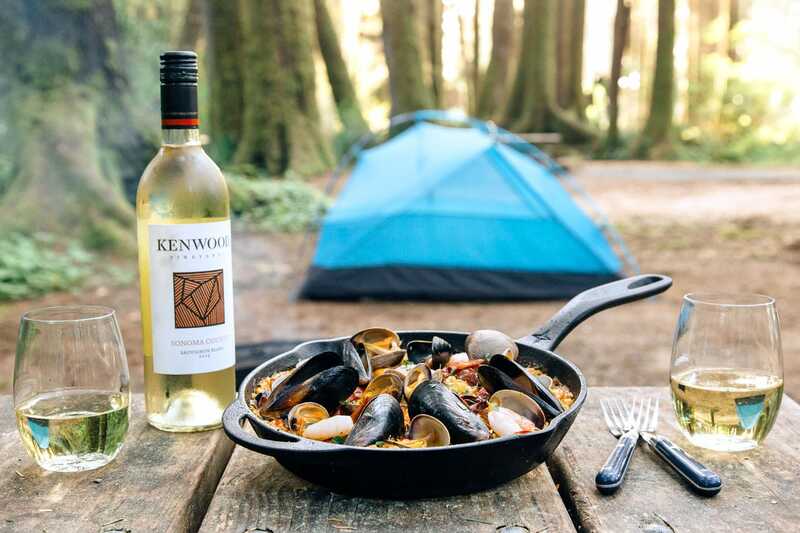 An impromptu camping trip to the Oregon coast offers us the chance to incorporate some local shellfish into this one-skillet seafood campfire paella recipe. The Oregon Coast is absolutely stunning – if you can see it through the fog. While this rugged coastline offers spectacular vistas, lush vegetation, and picturesque campgrounds, the weather there can be infamously uncooperative. Weeks of nonstop rain, heavy fog, and gusting winds prompted one camp host from Yuma, AZ to tell us that it had turned his southwest tan into pacific northwest rust. So when we saw a weather forecast that predicted two consecutive days of sun, we decided to jump on it. With little under 24 hours notice, we packed the car and were heading to the coast. We arrived in Newport, a small port town known for fresh seafood. As we cruised along the docks we saw rows of crabbing boats that had come in earlier that morning. Seals barked in the harbor and bearded men in yellow rubber waders sat outside smoking cigarettes. This was a salty fishing town if we ever saw one. So we did the only thing we could and stopped by a local fishmonger to pick up a few supplies for dinner. We were planning on making campfire paella so we decided to get some mussels, clams, and shrimp. Wrapped in brown paper, we placed our catch in our cooler and made our way a little further up the coast to Beverly Beach campground. 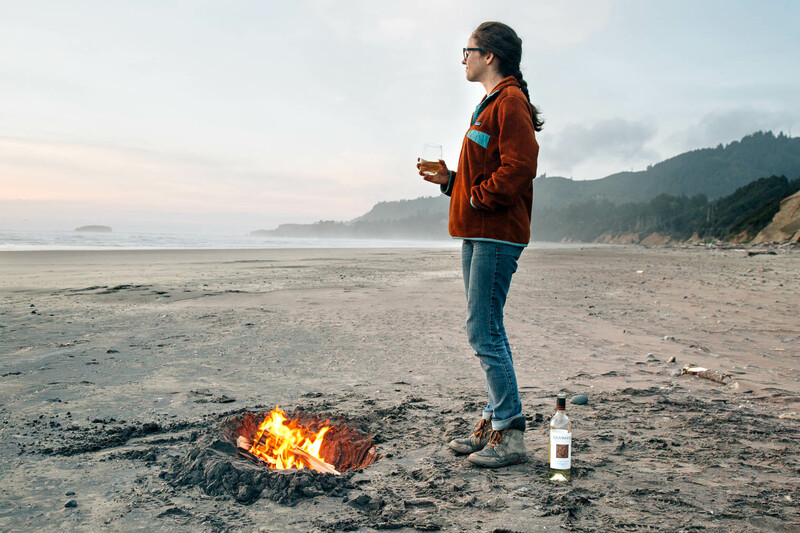 Oregon is one of the few places in the country where you are allowed to build fires on the beach. We had briefly entertained the romantic notion of cooking our meal out on the beach, but despite the clear skies, it was a still a little too blustery for that. So instead, we made dinner at the campsite among the coastal redwoods. 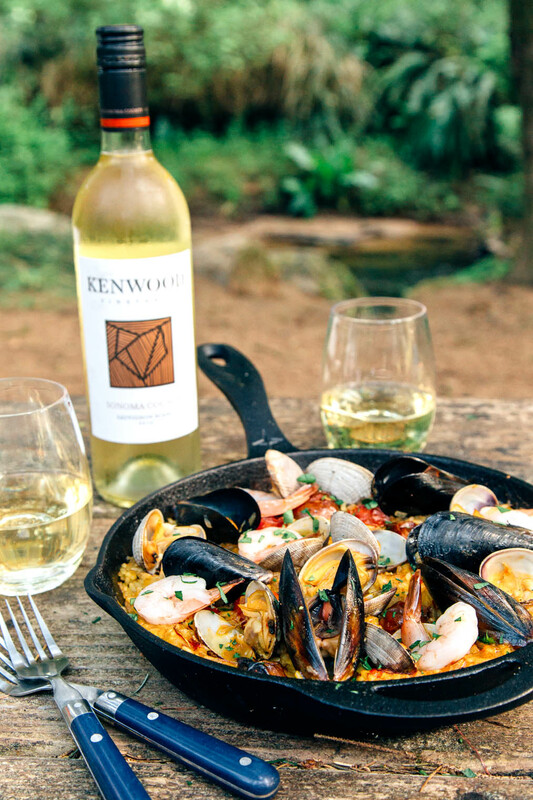 To make this recipe we partnered with Kenwood Vineyards, who reached out to us a little while ago to try a few of their varietals. 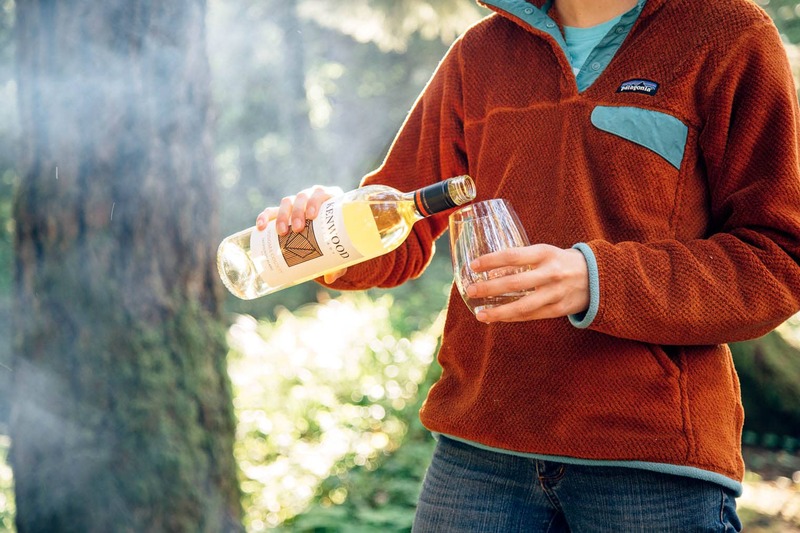 As this coastal camping trip started to rapidly come together, we decided to bring a bottle of their Sauvignon Blanc. 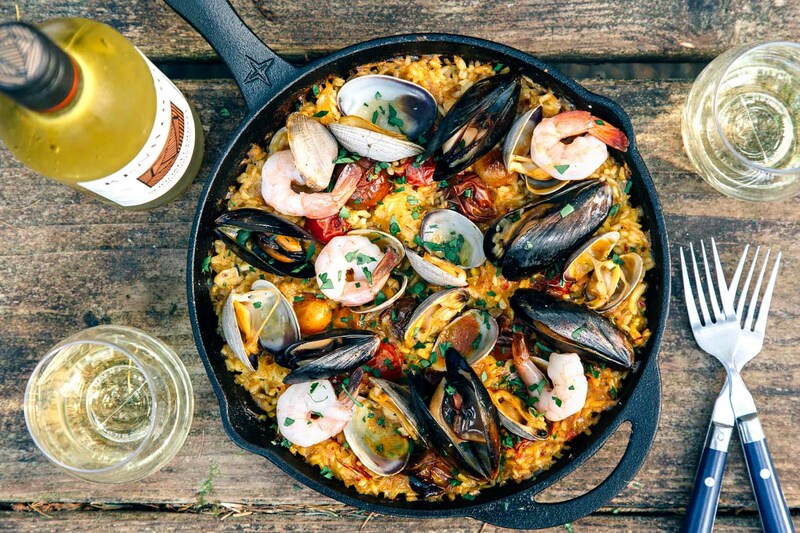 With a sweet aroma and crisp finish, this bottle was going to be the perfect match for our fresh seafood paella. Back at the campsite, we got a small fire going. In a 10” cast iron skillet, we sauteed some onions and garlic in olive oil, while grilling some cherry tomatoes off to the side. We then added the tomatoes, rice, and various spices to the pan and stirred to coat with olive oil. At this point, we were supposed to add the white wine but had a momentary panic attack when we realized we had forgotten to pack a corkscrew. A few swears and pointed fingers later, we remembered their Sauvignon Blanc is a twist top. Crisis averted! After that, the wine went in, followed by broth. We both had a drink. As the liquid simmers, the rice begins to cook. When the rice was looking al dente (about 15 minutes in) we added the seafood. With all the steam rising off the rice, the seafood cooks very quickly. So you want to avoid adding it too early, otherwise, it will overcook. With the liquid nearly gone, the rice done, and the seafood fully cooked, we pulled the pan off the fire. The pictures here don’t really do this meal justice. The aroma coming off this thing was just absolutely incredible. In fact, we didn’t even bother plating it. Instead, we ate it right out of the cast iron. After finishing the paella and half the bottle of wine, we were feeling pretty good. But we couldn’t let go of the idea of a beachside bonfire. We were so close. So we quickly cleaned the dishes, packed our backpacks, and walked down to the beach. Thankfully, the wind had died down a little and it looked like we were in for a golden sunset. These types of experiences never cease to amaze us. Just how quickly things can change. Only 24 hours ago we were watching Netflix and scrolling through the weather on our phones. And now we were sitting on a beach having a fire and watching the sun set over the Pacific ocean. It’s a great reminder that adventure is out there. You just need to go out and find it. Prep the seafood if needed - scrub the mussels and clams, debeard mussels & devein the shrimp or prawns if they aren’t already. 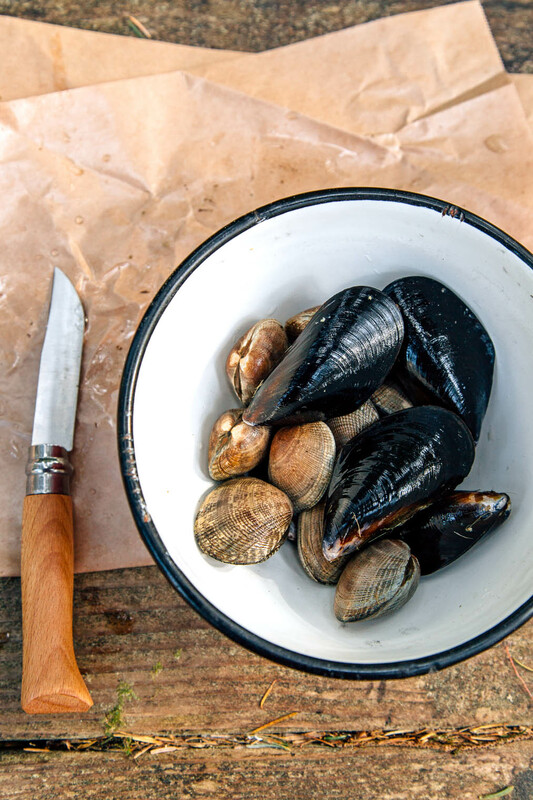 Place the mussels and clams in a large bowl of cold water to soak as you prep the rest of the ingredients. Start your campfire - you will be cooking over the flames at high heat, so no need to burn the wood down to embers. Place your cast iron on the grill to preheat. Optional step: Skewer the cherry tomatoes and place on the grill over the fire to roast. This helps to add a nice smokey flavor to the paella and it draws out some of the sweetness of the tomatoes. Measure 1 ½ cups broth into a cup or small bowl. Add the saffron to the broth and stir. Set aside. Dice the onion & mince the garlic. Once your fire is going and the skillet is hot, add olive oil followed by the diced onion, salt, and red pepper flakes. Saute for about 2 minutes, until the onion is just beginning to soften. Add the rice and the minced garlic to the skillet. Toast the rice, stirring frequently, 2-3 minutes or until it begins to turn golden (but not browned). Add the wine and stir until absorbed by the rice, about 3 minutes. Add the paprika, stirring briefly to coat the rice and then add the broth with the saffron and the roasted tomatoes. Give it a big stir to distribute all of the ingredients and then let it be. After 15 minutes, add the mussels, clams, and shrimp. Cook for roughly 15 minutes more. The paella is done once the rice is tender, all of the liquid has been absorbed, and you hear the rice start “crackling” - an indicator that the paella is forming socarrat - the wonderfully crunchy, brown crust that paella is known for. Remove from the heat, garnish with parsley, and enjoy with a glass of the remaining wine! Saffron can be pricey, but it does add to the distinct flavor of paella. Trader Joe’s has the best price we have found so far ($5.99 for a small jar, which we can make 3 paellas from). 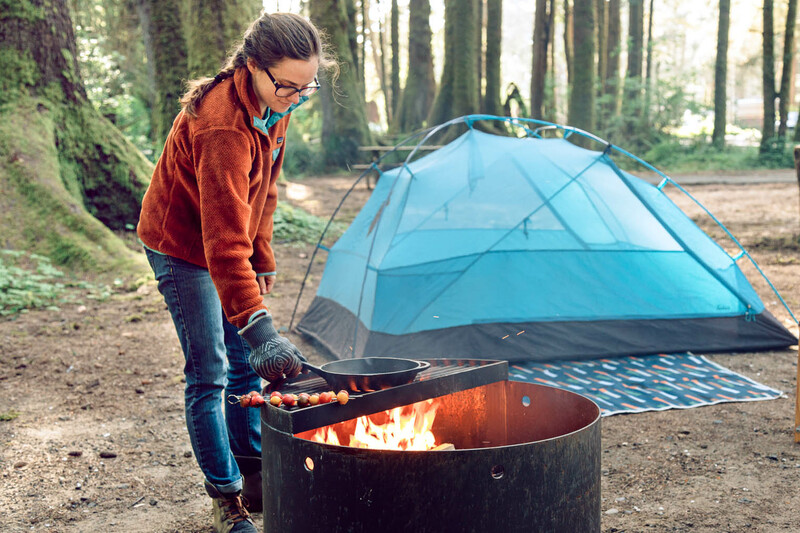 It’s good to keep in mind that campfires are not consistent heat sources the way that kitchen stoves are, so cook times can change based on variables such as how hot your fire is or how close the grill grate is to the flame. We’ve given times based on our experience, but they should be taken as guidelines only. We’ve added some visual indicators to help you adapt based on your particular fire. This post was sponsored by Kenwood Vineyards. Kenwood’s spirit is defined by avid curiosity, a love for the land and above all else, a belief that there’s always something more to discover. 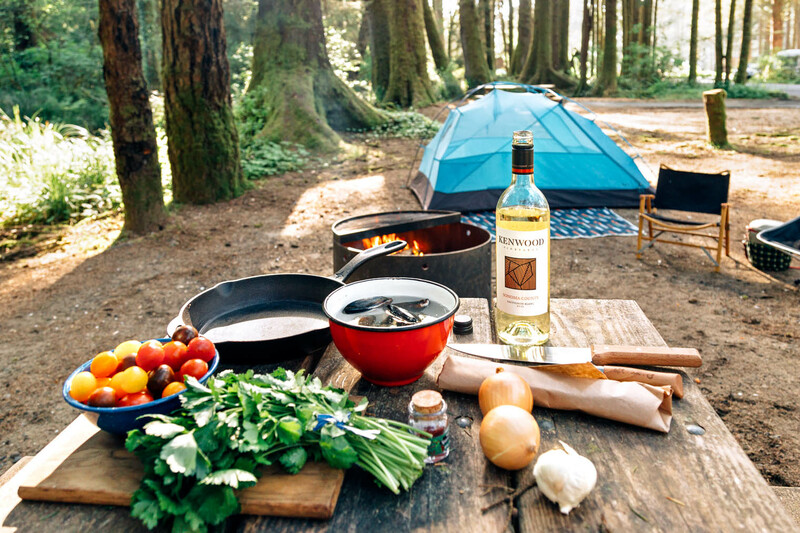 Passion for adventure and the thrill of discovery is at the core of Kenwood’s wild experience. We couldn’t agree more with that message and we are stoked to share it with you! Thank you as always for supporting the work that makes Fresh Off the Grid possible. This looks amazing! I’m actually making paella whilst camping this weekend. We plan on foraging for the shellfish so not sure what we’ll get! I usually add broad or string beans to my recipe too. Oregon sounds amazing. Thanks! Oh my! Just found your blog and loving it! The paella looks amazing! Welcome, Julia! We promise that the paella is even better than it looks 😉 Definitely one of our favorite camp meals so far! 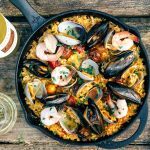 I love paella and this one seems delicious! Oregon seems like an awesome place for camping! Oregon is an *amazing* place to camp (as long as it’s not raining!) The forests here are incredible. You’ll have to experience it some day! My husband and I were just talking about camping meals tonight. This looks awesome! P.S. This seriously makes me want to visit Oregon. ‘Tis the season!! 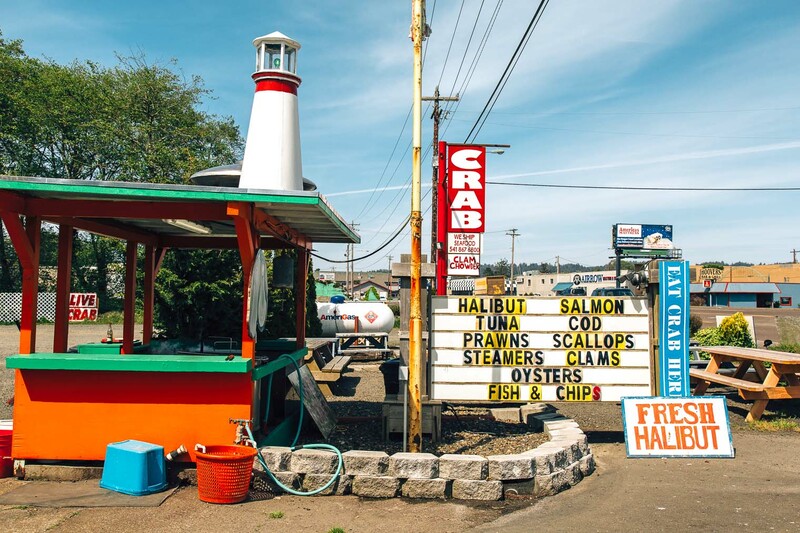 The Oregon coast really is an amazing place – we’re lucky it’s only a few hours away from us. If you ever get the chance to visit, I’d highly recommend it! 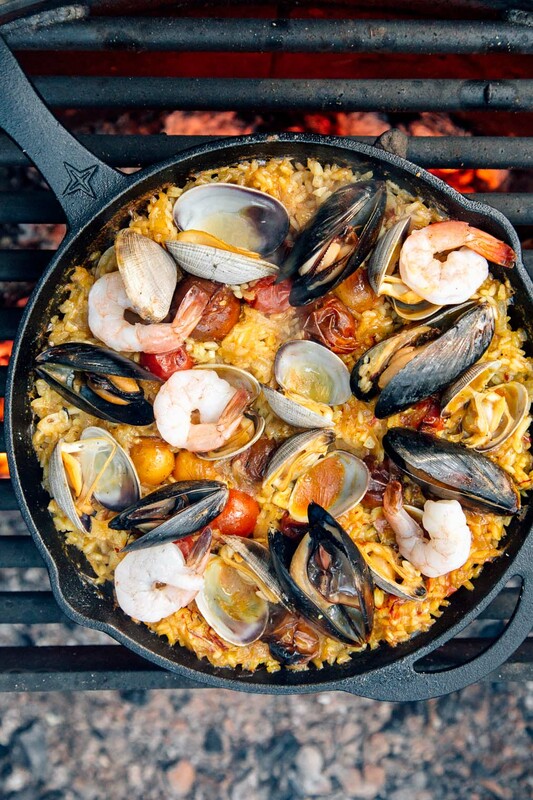 I never thought of paella as a camping recipe – but that looks perfect for it! (As long as you can get the seafood… LOL) But instead of waiting, I may try that recipe on the stove with the fresh seafood I can get right from the fishermen at home! 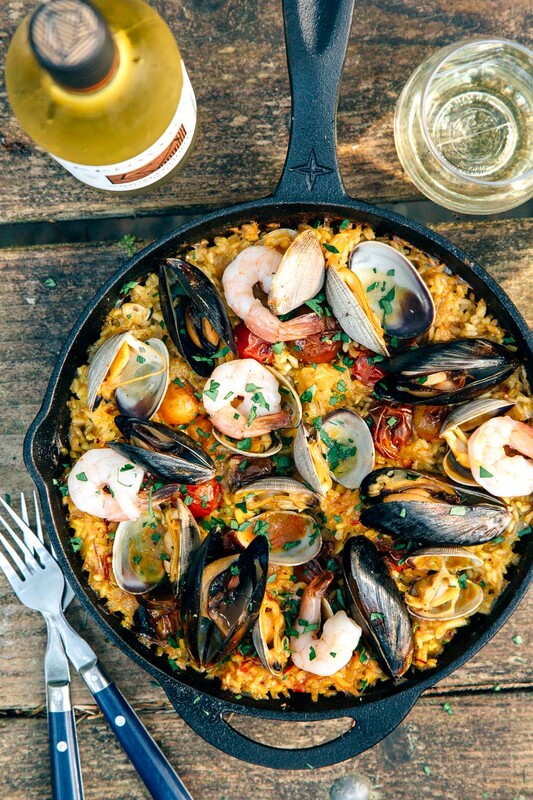 With fresh seafood, paella is – of course – amazing. But we’ve made paella with spicy chorizo sausage, pancetta, and even completely vegetarian versions. And they’ve all been delicious. The broad heat from the fire really helps heat up the whole pan (so you don’t get heat spots in the middle that result in cooked rice in the middle and uncooked rice on the edges) So use the widest burner you have on the stove top to heat up as much of the pan as possible.